This tip is based on the simple idea of using solar energy to melt chocolate. The delight of the tip is that it turns what is usually a disaster – chocolate melting in the sun – and turns it into an opportunity: chocolate fondue in a jar! Simply add equal parts dark and milk chocolate to a jar, put on the lid and pack it with the picnic along with lots of strawberries and cherries. Then leave the jar in the sun whilst you’re tucking into the savoury part of your picnic. 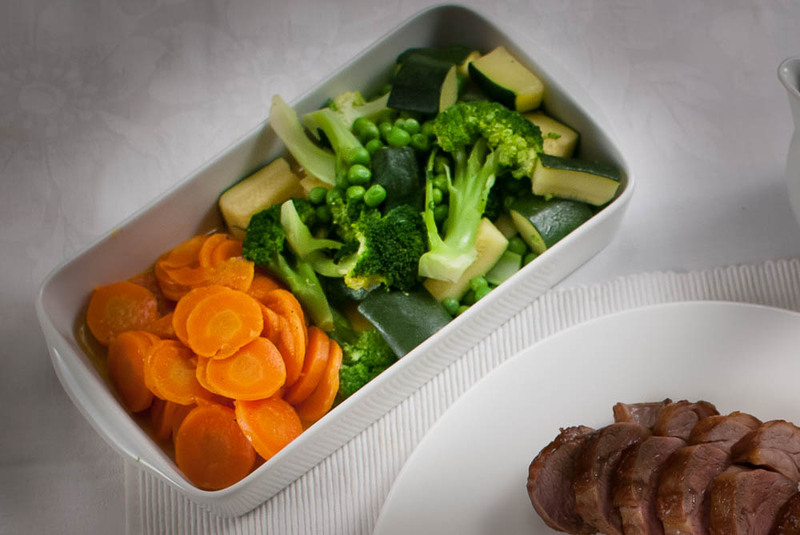 By the time the sarnies have gone, the barbecue chicken has been noshed, and the last remains of the pasta salad is being sealed in its Tupperware boxe, the chocolate should have melted. Then pour the chocolate into a dish and dip the fruit into the chocolate. I was surprised that melted chocolate at a picnic would be so engaging and entertaining. Indeed, it might be advised to keep the magic substance out of view – and out of mind – at least until the children have had some of their five-a-day. The only caveat to this tip is that one must guard against a primal urge to allow chocolate to spread over the face and hands or drip onto tablecloths, picnic blankets or your best picnic outfit. I’ve seen grown-ups holding little ones in their laps and sharing the last remains of the chocolate dish, each using all their fingers to capture last traces. It’s therefore a good idea to pack plenty of wet and dry hand towels to keep tabs on any mobile chocolate. But, don’t take it too seriously, the jeopardy of melted chocolate at a picnic is all part of the fun. It will bring huge amounts of enjoyment and great memories to your picnic. 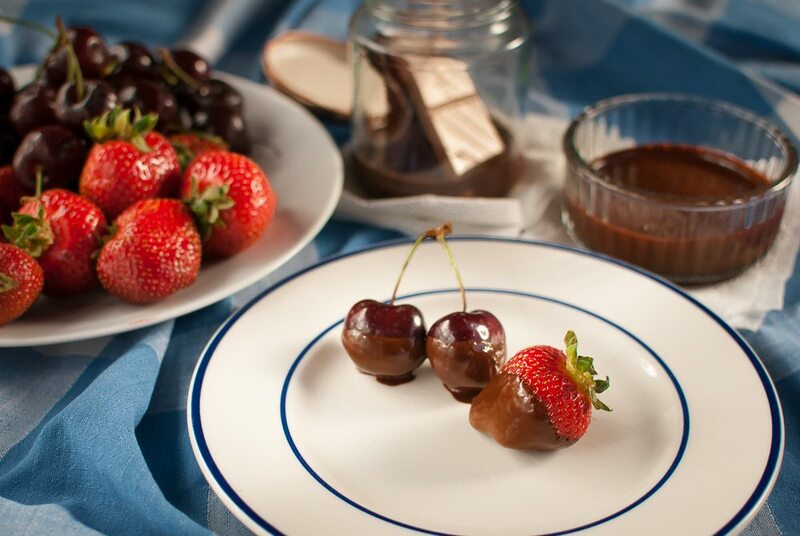 One young lad, having partaken in several chocolate-coated strawberries and cherries, announced that strawberries and chocolate were an excellent idea. He then declared that actually the strawberries were not a good idea and that the cherries were better idea. Finally, he corrected himself and concluded that both the strawberries and the cherries were not good ideas – he only thought the chocolate was a good idea! I’ve used equal amounts of plain and milk chocolate. This helps to appeal to both adult’s and children’s taste, it also gives sweetness without the need to add extra sugar. Avoid adding other ingredients that you might use in a chocolate sauce, amalgamating these might be beyond the capabilities of your little solar-powered oven. Commercial tortilla chips are good, but they are nothing like real tortilla chips (and they’re very salty). Real tortilla chips from real Mexican tortillas are notoriously tricky to make and almost always disappointing to our tastes. Recently, it is possible to buy tortillas specially made for frying online (but this is a hassle). If you want a quick fix for a more authentic tortilla chip then try this trick using widely available Mexican wraps from (UK) supermarkets. If you’ve ever tried to deep fry soft wraps to make tortilla chips (and I have), you will know that it does not work. Same with light frying. 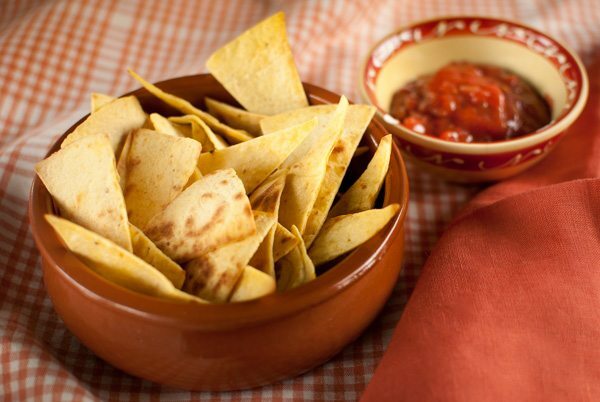 Cut the tortillas into chips. Start by stacking 3 tortilla chips and cut in half. Then stack together and cut in half again. Then stack together again and cut into 3. Toss them all into a large dry frying pan (no oil) and cook on medium-high heat. Wait a couple minutes before start tossing the pan. Then toss continuously until as evenly browned as possible. Add two teaspoons of groundnut oil – or similar – and toss until all the chips are lightly coated. Put onto a bacon crisper or rack and allow to cool for about 3-5 minutes. Put the crisper and chips in the microwave for 1 and a half to 2 minutes on full power. If you don’t have a bacon crisper you need to avoid direct contact with the chips and a flat plate – try scrunching up greaseproof paper as shown in the photo below, or if you do use a plate turn the chip over after 45 seconds. Immediately put the chips onto scrunched up greaseproof paper or a rack to air and cool. Serve with a salsa or dip of choice. Tom Kime’s cookbook, Exploring taste and flavour, demonstrates how the tastes of salt, sweet, sour and hot are so important in cooking. We associate these four tastes most commonly in Oriental food. A Thai curry for example, will be flavoured with a balance of salty fish sauce, sweet palm sugar, sour lime and hot chillies. But Kime also suggests that the everyday BLT is a combination of these four essential flavours: bacon is salty; white bread is sweet; tomatoes are sour; and leaves such as rocket are hot and peppery. We can imagine other foods working to the same principles. An American BBQ sauce is a taste sensation bigger than the sum of its parts, but those parts comprise salt, sweet, sour and hot. Surely, not all four flavours all the time? True, not all food is balanced in this way. Pairs of flavours can work well. ‘Sweet and sour’ come together famously in the classic Chinese sauce – but also when sweet pork is paired with sour apples. ‘Salt and sour’ are an effective duo as in ‘salt & vinegar’ flavoured crisps. Surprisingly, food rarely comes in the form of a single flavour. Even a bag of sweets can be a complex melange of flavours – usually including fruity or sour flavours. Bite into an apple and it will seem a perfect mouthful of sweet flavour. But in fact the fruit is both sweet and sharp. We may crave sweetness, but we also need a little sour to offset the cloying effect of sugars. It appears our palate is designed to always seek other taste dimensions. If we add a piece of cheese to our apple we are pleased with the extra taste of salt. So we also add a pinch of salt or salty nuts to an apple crumple (or add salt to caramel or chocolate). And there are many fruit recipes which push the numbers of flaovurs, such as grilled plums or strawberries doused with acidic balsamic vinegar and a grating of pepper. Often the flavours are all present – but not in the same place. Chinese ‘salt and pepper’ prawns sound very happy with their two flavourings – but they are served with a ‘sweet and sour’ dipping sauce. In France they might serve a simple salad of sweet lettuce with a separate salty, sour and hot dressing. It is interesting to note that Mexican food is not ‘hot’ per se, dishes can be quite mild but are served with an assortment of hot salsas and relishes. And it does not stop with these four tastes. We can add bitter to the equation. Salty peanuts are perfectly balanced by bitter beer. Even chocolate has subtle bitter notes. However, bitter is the odd one out, when it comes to taste and flavour our palates are naturally suspicious of bitter tastes – a primordial indicator of toxins. Most chefs now assume that there is a fifth taste: umami. Why is tomato ketchup so compellingly good? Apart from the distinct notes of all four tastes, there is also a satisfying savouriness and unctuousness that comes from the tomatoes – that’s umami. Chefs keen to enhance their food will work with foods rich in umami such as tomatoes, mushrooms, cheese, soy and even seaweed. First, you must break through the tough and weathered outer ring of leaves. The flesh is stringy and hard but will whet your appetite for more. Then venture onward, gnashing your teeth as you go, past the inner ring of delicate, purple-tinged leaves. Continue your passage until you reach a gossamer veil of petals covering the precious central core of the artichoke. To complete your quest you must lift the veil and remove the notorious and fearsome ‘choke’ – a spiky barrier protecting the tender heart below. Your challenge is to coerce the choke’s fibrous tendrils into releasing their tenacious hold on your prize. Using skillful manipulations of knife and spoon, you will soon discover where the weaknesses lie. 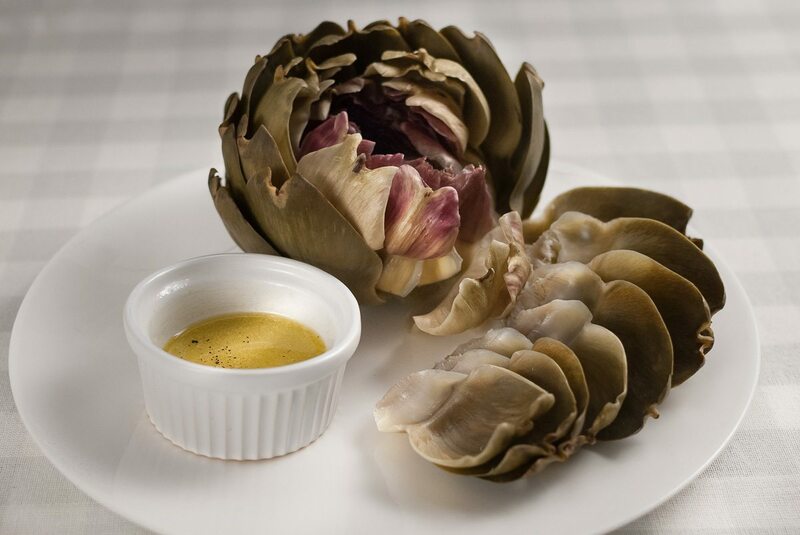 Once the choke has been removed and conquered, your treasure will be revealed – the heart of the artichoke. The quest is complete. See recipe for dressing and cooking method. These rice balls are a revelation. So simple and so easy. Apparently, in Japan they are eaten in the same way we eat sandwiches. So, what makes them so good and so easy? The answer clearly is not that obvious – otherwise we would be eating them all the time. You have to put your mind to the physics of making rice stay in a ball, then it does become obvious – stickiness. And sushi rice is nothing if not sticky. The same property that ensures the rice stick to your hands – and makes it almost impossible to manipulate – now works in our favour by sticking to itself. The revelations continue when you realise you can put just about anything in with the rice and that they can be cooked in differently styles. I immediately thought of arancini. The arancini version is particularly successful – and (ahem…) I have to admit an improvement upon the Italian versions (…sorry!) The size is more appealing and the ‘filling’ is much easier to work with. A recipe is not really necessary. It’s common sense really: take some cooked sushi rice (don’t add sushi dressing) and mix with other ingredients. Form into balls and serve with a dressing. I had a soup bowl full of leftover rice and I used 150g of shitaki mushrooms – this made about 10 onigiri. I put the chopped mushrooms in a wok with a lid and some oil and put the heat on low and waited for the moisture to be released from the mushrooms then I turned the heat up and fried and seasoned. I added a little chicken stock and cooked until absorbed in the mushrooms then I mixed in the rice. Form into balls using cling film – then moisten your hands and finish into a neat ball. Garnish with chives or other mini leaves or herbs or sesame seeds. They worked really well with simple soy sauce, but other Japanese dressings would also be good. Then I fried some in oil and then coated others in flour/egg/panko crumbs and deep fried and served with a sweet chilli sauce. This method first boils the octopus and then cooks it in a quick confit. Tradition has it that putting a wine bottle cork in the water will help to tenderise the octopus. I suspect the freezer will have had more to do with this claim than the cork. My 1080 Recipes, the classic Spanish cookbook also describes a way of plunging the octopus repeatedly into boiling water. We are also told that octopus should be bought with double suckers on the legs (a double-suckered octopus is reputed to have better flavour than the single-suckered type). Whether this kitchen myth or fact is difficult to prove. 1 large frozen octopus – roughly 1.5kg. First prepare the octopus. It should have been cleaned, but it may be necessary to remove the beak and the remainder of the eyes. Fill a large pan with water and bring to the boil. Add plenty of salt – some say as salty as the sea… but good large pinch should be fine. Add 6 onion segments and the bay leaves. Cook the octopus for an hour but check after 45 minutes to see if it is tender. It may take as long as 1 1/2 hours. The octopus should not be overcooked as it will lose its fresh taste and the suckers will fall away from the legs. Drain and dry the octopus. Chop the octopus into pieces. Discard the head – though it is still good to eat. In a small heat the olive oil with the garlic and onion on a low heat for 10 minutes. Strain and discard the garlic and onion. Pour the oil into a large frying pan and add the octopus. Warm on a low heat for 5 minutes. Drain the octopus and arrange on a platter or plates. Sprinkle over the paprika and garnish with chopped parsley. This time the octopus is braised in it own juices i.e. without any additional liquid in the braising pot. Many chefs eulogise about how cooking without water is such a revelation. First prepare the octopus. It should have been cleaned, but it may be necessary to remove the beak and the remainder of the eyes. Freezing tenderizes the meat so there is no need to bat the octopus. Put the octopus in a large heavy cast iron pan along with the following: a good glug of olive oil, the sliced chilli, 3 cloves of garlic, one onion cut in quarters through the root (so they stay intact), the celery, the stalks from the parsley and the bay leaf. Put the lid on the pan and put on a low heat. The octopus cooks in its own juices, which will be considerable. Cook for up to 1 ½ hours. Check after a 45 minutes to see how it is doing. The octopus should not be overcooked as the suckers will fall away from the legs. Take off the heat when it is tender and leave to cool. Boil the potatoes until cooked. Peel the skins when the potatoes have cooled enough to handle. Cut the potatoes into smallish pieces – about the same size as the octopus will be when the legs are cut into sections. Whilst the potatoes are boiling, chop the onion finely and cook with a couple of tablespoons of olive oil until soft and transparent but not coloured. Add the vinegar and reduce until evaporated. Add the potatoes to a bowl – spoon over the onions and mix. Cut the octopus into sections and add to the bowl. Add a good squeeze of lemon – to taste and check the seasoning. Squash ½ a garlic clove on a chopping board and add put a small handful of the parsley on top and chop to mix the parsley and the garlic. Put a couple of teaspoons of this onto the octopus and potatoes. Don’t swamp the mixture with parsley. Place a few salad leaves on each plate and spoon the octopus on top. Garnish with a sprinkle of chopped chives, and a wedge of lemon. Richard Olney in his book, Simple French food suggests that an octopus would be very good cooked as a daube, i.e. as a French Provencal stew. 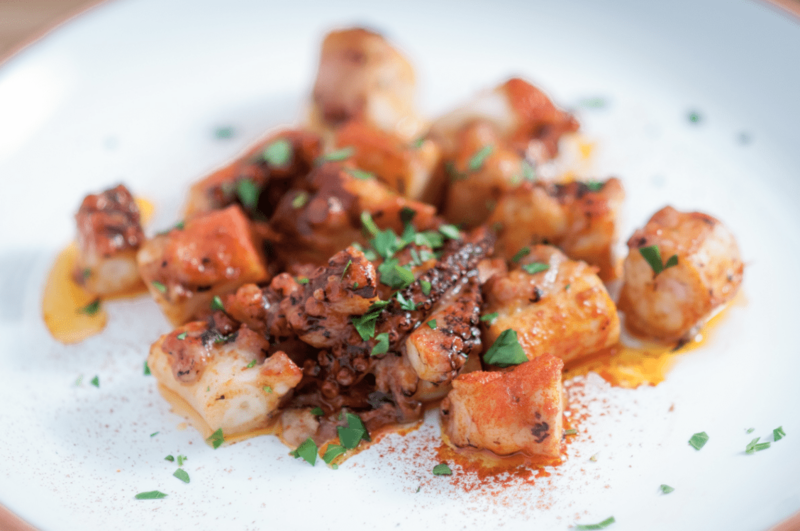 I had some trepidation with the idea of octopus braised with aromatic vegetables, (as if it were neck of lamb or shin of beef), but in fact it is not that far removed from a zarzuela – or as Mr. Olney mentions, the rich tomato and garlic based sauces associated with seafood, such as a la Setoise, Nicoise or Provencal. With the sushi mold broken two other raw fish dishes have now appeared, both based on the familiar raw meat dishes carpaccio and steak tartare. The former is thin slices of raw flesh and the latter is either chopped or minced flesh, usually formed in a neat disc. In both cases the fish of choice is invariably tuna, probably because it has a robustness similar to beef. 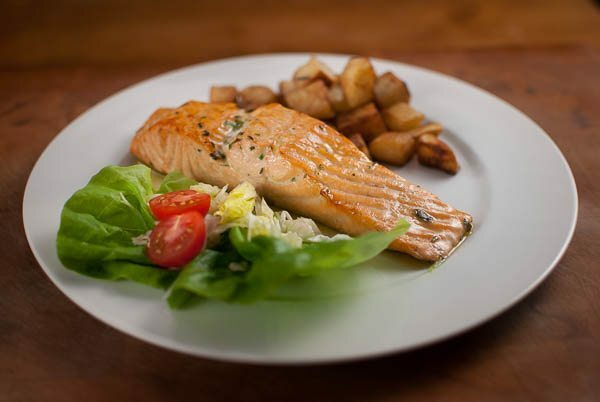 Salmon is more delicate than tuna, both in taste and texture. Marco Pierre White’s tuna carpaccio Niçoise, for instance, includes Mediterranean herbs, olives, capers, peppers and anchovies – a mixture of tastes which is very good on tuna but over-powers the poor salmon. My carpaccio allows the taste of the salmon to come through. In fact, this is a great example of sourcing not saucing. There are three key ingredients: basil flowers (Africa variety from Casanova & Daughters), Ravida olive oil, and top quality salmon. This recipe is brilliant and is a classic demonstration of how a simple preparation with the best ingredients can produce a stunning dish. The three main ingredients with lemon zest and salt and pepper. The pastry brush is used to work the olive oil into the salmon. The basil flowers are inside the paper pack. Open the wide end and scrunch between palms to release the herbs. The basil flower variety has a fennel note, with a dry Mediterranean herb taste. A good alternative (tried and tested) is fresh tarragon and a little dried oregano. This salmon is from the top of a middle side of a fillet, with skin and dark meat removed (the remainder of my piece prepared for sushi – see below). It is about 138g in total – half will cover a normal dinner plate – so the whole piece will make an impressive starter for two. Put one of the pieces on a large sheet of cling film, then lay another piece on top. Gently flatten the salmon with a meat hammer or rolling pin. It should expand to twice the surface area of the original piece. The principle is similar to making escalopes – hammer gently from the centre moving the hammer to the outside of the piece as you press down on the flesh – spreading as well as flattening. Carefully peel the cling from one side turn over the cling film and, very carefully, align the salmon in the centre of the plate and drop down. Again, very carefully, peel the cling away from the fish. NB: I have used the word ‘carefully’ three times because you only have one chance to get this right – the fish is too delicate to move around or preposition once it’s on the plate. Next spread a good, rich but not too strong or grassy, olive oil over the salmon using a broad pastry knife (I used Ravida olive oil – an excellent oil with tomato, green leaves and apple taste notes). Sprinkle with basil flowers, a little lemon zest, chives, parsley salt and pepper. 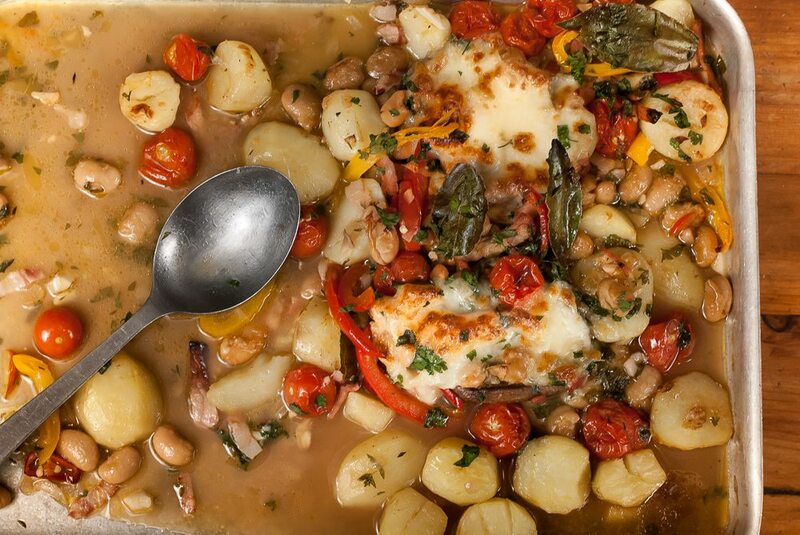 Serve with wedges of lemon and some good toasted crusty bread. Based on the idea of raw chopped or minced beef. Steak tartare usually includes chopped cornichons, capers, and onion – often including mustard and Worcester sauce. It should always have a raw egg on top. I started with steak tartar as a template and have adapted by taste to make my own version. I like the idea of shallot in the mix to give some texture. I soaked the shallots in water to take away the bitterness and sharp heat of a raw onion. Capers work very well with salmon but I did not want the mix to be overpowered with acid or salt taste so have soaked them as well. Cornichons add too much lingering dill pickle taste so I have omitted and used fresh cucumber int he garnish. Mustard is surprisingly good and even better with anchovy sauce. Lemon is tricky with a tartare. I need the freshness of lemon but do not want to cure the flesh as in a ceviche, so I use the zest and add a squeeze of lemon right at the end. I finish with a salad garnish. The basic ingredients. 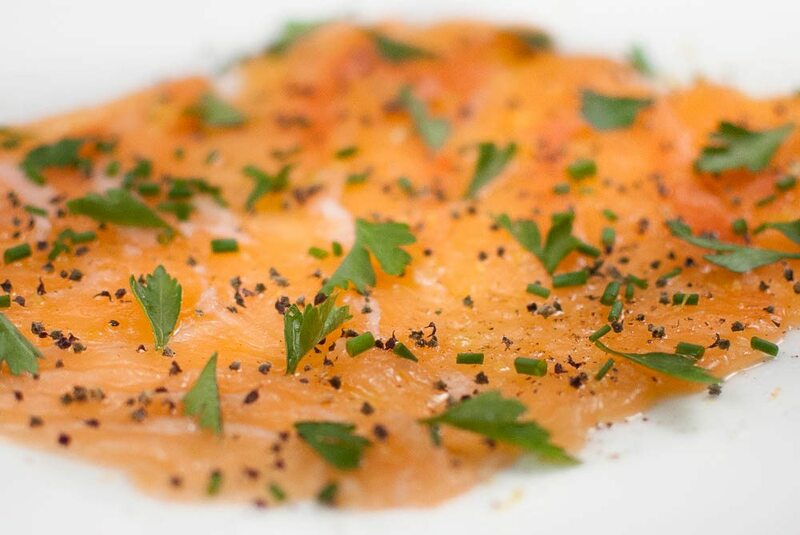 For the tartare – (salmon), shallot, parsley, mustard, anchovy sauce, capers and lemon zest. For the garnish: tomato, roasted peppers from a jar, cucumber, chives and parsley. Worcester sauce is used in the egg garnish only (see below). Chop the salad garnish and put in a bowl ready to mix with a vinaigrette dressing. 100g of good salmon. More than enough for a single starter portion. Chop with the other ingredients. Mix these to taste. I cut back on the shallot. Soak the capers in a couple changes of water squeezing out the water. Soak the shallot in water for 15 minutes and dry. I was not keen on a raw egg on my salmon so I soft boiled my eggs, used the yolks only. Mix with a tablespoon of good thick creme fraîche. Season with salt and pepper, tabasco and Worcester sauce. Add a pinch of xanthan gum powder and form into a quenelle. (Yes, a home cook can use xanthan gum – it’s available at Lakeland.) touch over the egg. The finished tartare. Form the chopped mix into a patty and add the egg yolk quenelle. Sprinkle unsmoked paprika as finishing touch for the egg. Arrange the salad garnish. Drizzle with extra olive oil and serve with lemon and a slice good crusty toasted bread. It’s really good. Raw fish in the form of sushi was once a esoteric rarity, only available to the travelling cognoscenti. But having been popularised by Yo! Sushi! it’s now omnipresent on the shelves of many fast food outlets such as Pret a Manger, Wasabi and Itsu, or even your local supermarket. There has also seen a rise in sushi bars and restaurants, from the accessible and reasonably priced Sushi Tetsu, to the exclusive and astronomically priced Nobo. But you know what? You don’t need to buy sushi from a chain or an expensive restaurant – you can make it at home. Start making the rice. First rinse the rice. The Japanese have a knack with this. It involves kneading, swishing and straining with the palm of the hand. I don’t get it, I’m afraid, so I use a whisk instead. Rinse the rice about 5 times until the water is clear, as in the photo. By volume I measured 200ml of rice in a measuring jug. This was enough rice for about 14 balls of rice. Let the rice drain for 30 minutes. This is actually allowing the water to penetrate the surface of the rice rather than ‘drying’. Put the rice with 250ml water in a heavy pan with lid. Bring to the boil then immediately turn the heat down the lowest setting, put on the lid and cook for 15-20 minutes. Turn off the heat and let the rice steam for 10 minutes. Make a sushi dressing by gently heating 70ml rice vinegar, 45g sugar (yes – it does seem like a lot! – but you know how the Japanese like their sugar…) and 10g salt. Put the cooked rice in a bowl. Fold the dressing into the rice – add to taste (I did not use all the quantity I made). Then spread the rice out to cool. In a Japanese home or a sushi restaurant the rice is served ideally a little warm. But at home it is unlikely that we will have the ability to time to this exactitude. Instead, leave the rice until ready. NB: there is sufficient acid, sugar and salt in the dressing to prevent the breeding of harmful microbes in the rice. It will be safe to leave out of the fridge for an hour if necessary. Ideally, serve with cold fish on room temperature rice. Failing guests arriving on time – do use the fridge, especially to keep the fish fresh. Now the fun part. Making the little balls of rice for the sushi. Use cling film to begin with then form into squat sausage shapes. I find there is not other recourse than to use moistened clean hand – but keep the wetness to an absolute minimum. When you will finish you will know what they mean by ‘sticky’ rice! Make a mooli garnish while the rice is cooking. Peel the mooli and make julienne slices with a special julienne tool. Freshen the mooli in a bowl of cold water for 10 mins and drain well. Now the fish. I have used a middle cut of a side of salmon. This piece shows the portion that is suitable for raw fish. It is about 825g. I made all three raw dishes from this single piece – enough for raw starters for two from each recipe, a hot pasta dish from two from the remainder and even a dish of nice brown meat for the cat. Turn over the fillet and slice off the skin and remove the skin and dark meat – use your best stainless steel knife. Cut the fillet in half along the original length of the side of salmon. This leaves a thick top half of the filled. I don’t own a sujihiki slicing knife or a yanagiba sushi knife but I do have a Miyabi gyutoh – Western balanced – cooks knife. This knife is thinner and can be made sharper than any of my carbon steel knives. It is also stainless steel so the metal will not taint the delicate fish (which carbon can). This is much easier than it may seem. With the right knife the salmon cuts like butter. Make your sushi pieces and store in the fridge until ready to prepare. 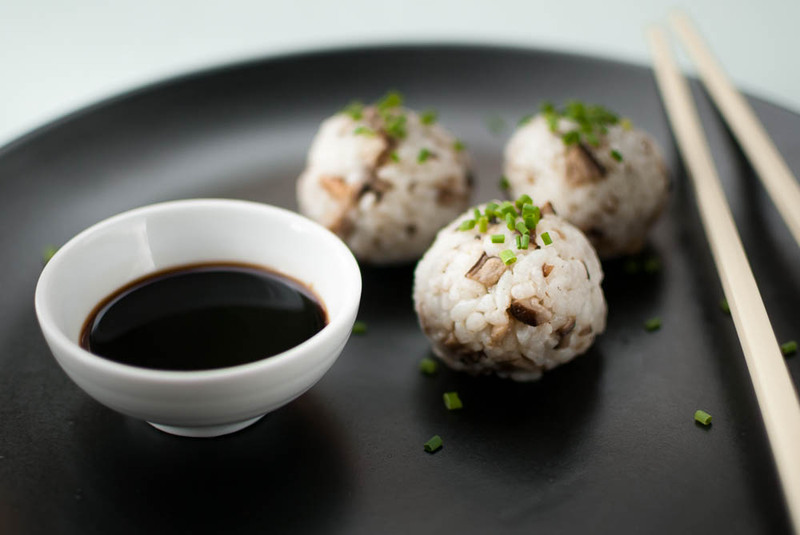 Form the balls of rice into the shapes shown above, put a little wasabi on the rice. Add the wasabi to taste, I have used quite a lot (!). Put the fish on each and decorate with chopped chives. We’ve all heard of ceviche – you know, where the lime ‘cooks’ the fish – but why don’t we see more of it? Ceviche is common way to eat fish in Mexico and Latin America. Could the climate and geography of these regions make it more palatable? Possibly. I can imagine if I travelled to the West coast of Mexico and was sitting in a cantina, basking in the tropical sun, gazing out over the Pacific Ocean while sipping an ice cold cerveza , the mahi-mahi ceviche would go down very well indeed. Is this the reason ceviche cannot find traction in our cool and temperate land? Or are we just suspicious of the unfamiliar; happier to choose fish that is properly cooked – preferably deep-fried and coated in batter! Well, what ever the reason, we should be eating this all the time – it really is very good. 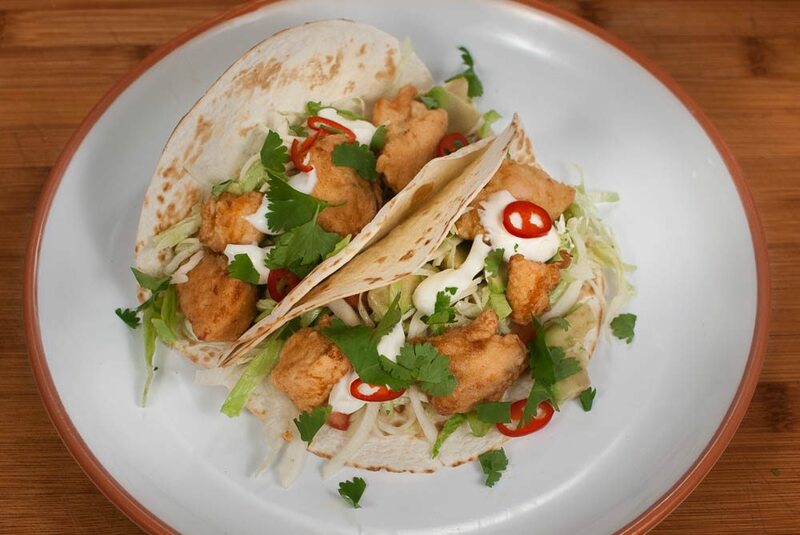 It’s no more trouble than making a taco and certainly much easier than making fish and chips. Make it as a starter – and use salmon, it works brilliantly. As well as fish, you can ‘ceviche’ any kind of seafood, Mexicans are fond of using prawns, squid, clams and scallops. For this much fish (about 180g), I used half a lemon, half a lime, half a small blood orange, half a shallot and 2 tbs ginger beer. I used a good pinch of salt, pepper and sugar. The salmon is skinned and sliced thinly. Slice the shallot thinly, mix all the curing ingredients and pour over the fish. NB: I am using orange, and ginger beer to tone down the sharpness. Before and after. I cured the salmon for 2 hours. The effects of the cure can clearly be seen. The salmon is opaque all the way through, the slices have some bite and firmness to them and seem like a normal piece of cooked fish. However, it has a fresh and satin-soft texture which is deliciously satisfying. 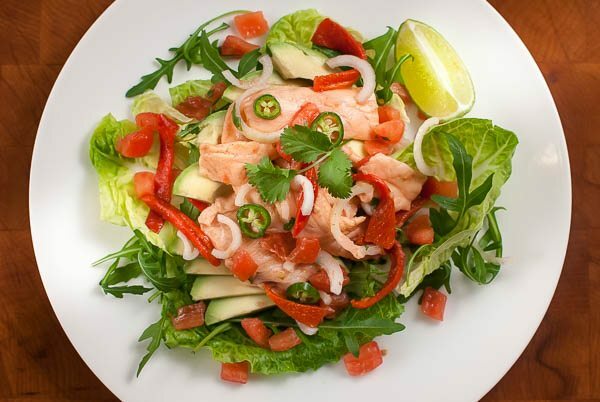 Drain the salmon and layer green salad leaves, avocado, skinned and cubed tomato, sliced roasted red peppers from a jar, a few of the shallots, chilli and cilantro. Taste and season. Drizzle over some olive oil and serve with lime. Ingredients for the cure and presentation. Juniper, star anise, fennel seed, pepper, sugar, dill, lemon and salt. I used about 200g of Malden salt, crushed the spices in a pestle and mortar and then blitzed the sugar, a quarter chopped lemon with a spoon of salt. Once this was blended I added the rest of the salt and blitzed for a second, then mixed by hand until all blended. The salmon after 12 hours of curing (and soaking). Discard the curing mixture and soak for 1 hour in cold water changing the water every 15 minutes. Press lemon rind and chopped dill and pepper into the salmon and cut into thin slices. Arrange on a cling film and cover with another sheet of cling film. Use a pan to flatten. Arrange on a plate. 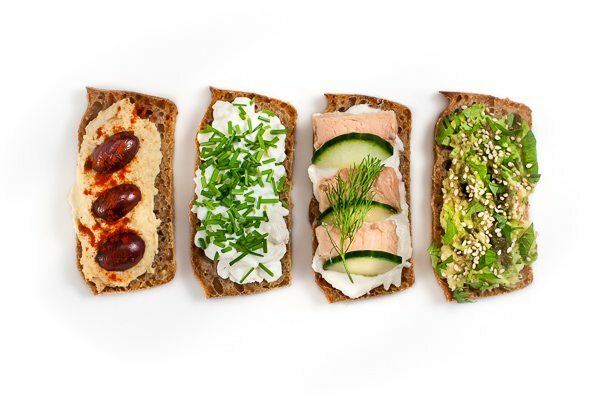 Serve as an hors-d’oeuvre or starter with rye sourdough bread, salad and lemon. You could use a thin mayonnaise and mustard dressing. This is rather similar to ceviche, but the fish is cooked before it is covered with curing liquid. The method is also used for pickling vegetables. In Mexican cooking en escabeche describes a ‘light’ style of pickling, famously used for purple pickled onions and jalapeno chillies (my recipe is based on a jalapeno chilli escabesche). I have recipes from Mexico for octopus and oyster escabeche and in Europe I have also seen it adopted with oily fish such as mackerel. 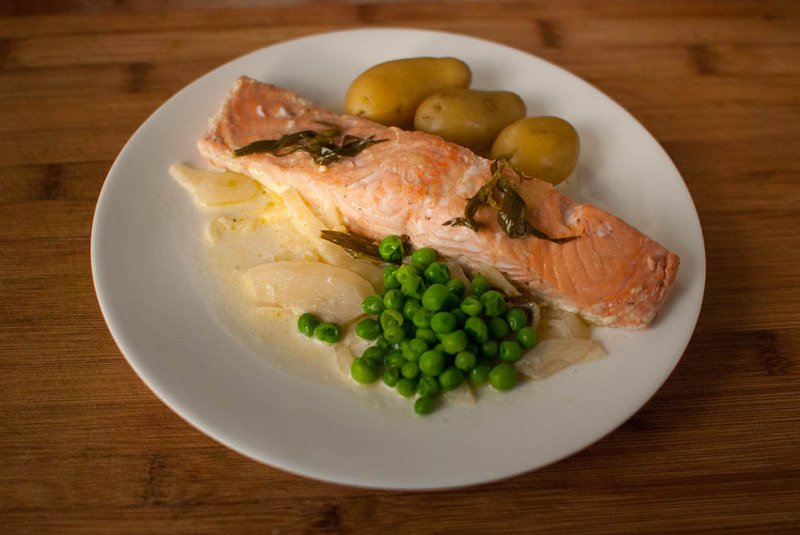 Salmon is also oily and works a treat as an escabeche. The pickling ingredients: pepper, cloves, dried oregano and thyme, allspice, lime and bay leaves, cumin, salt and pepper, white wine vinegar (with chicken stock at twice the volume of the vinegar. Veg to go with the pickling liquid. First heat the stock and add the all the spices and herbs, sugar, salt and pepper and simmer for 5 minutes, then add the vinegar and simmer 2 minutes. Fry the carrots, cauliflower, pepper and garlic (3 cloves, peeled and left whole) for 3 minutes. Then add the shallots and chilli and fry a further 3 minutes. Then add the pickling liquid and simmer for a further 5 minutes. Adjust the timings to suit. We want crunchy vegetables – but cooked sufficiently to mellow the marinade and penetrate the veg. While the vegetable finish simmering, fry a lightly floured fillet in a pan on a medium high heat. Make sure there is some colouring on the salmon. It should be nearly cooked. Then transfer to a deep dish and pour over the hot vegetables and liquid to marinate. Leave to cool and refrigerate overnight. If frying another piece of salmon fillet is becoming predictable and too familiar, try cutting it up and stir-frying instead. It’s quick and easy – and you’ll find yourself with a highly versatile new ingredient. Stir-frying is a good way to cook salmon – the salmon is robust enough to stay in whole pieces, it will brown in an appetizing manner and stays tender and tasty. Also stir-frying is more economic than frying single fillets as stir-fried fish can be stretched among other ingredients. In this recipe I stir-fried the salmon as part of a warm Thai salad. You could add the stir-fried salmon to other types of warm salad, as I have in my salmon and spelt salad, or you could make an Italian tomato sauce or a creamy wine and tarragon sauce and serve it with pasta or rice. Here are the salad ingredients: pak choi (leaves separated from the stalks), carrots, cooked refreshed and drained pad Thai rice noodles, cooked refreshed and drained bean sprouts, pepper, celery, spring onion, ginger, chilli. A note on bean sprouts. There was a time when we ate bean sprouts raw, however, it turns out that this is no longer considered safe. This is a shame because most of the appeal of a bean sprout is its crunch – which is quickly lost when cooked. The problem lies in our inability to generate sufficient heat at home to cook them quickly. Our only options are to drop them into a commercial vat of boiling water for 10 seconds, or to take them to the local Chinese takeaway and give them a quick stir-fry over their 250,000 BTU wok burner. However, I believe I have found a domestic solution to this conundrum: the microwave cooking bag. I microwaved my sprouts for a couple of minutes and then plunged them into cold water and drained. I can vouch that the sprouts were not only well-cooked but also crunchy. Cut the salmon. I have cut the salmon differently for each of these three recipes. Here I am cutting into small cubes so they easily distribute through the salad. Stir-fry the salmon. The wok must be very hot. Then add a small amount of groundnut oil. A typical gas range can only manage a measly 6,000 BTU, so don’t shake, bang and toss the wok about like they do in the takeaway – instead let it sit without moving. After it has browned and coloured on the pan-facing side, stir and toss to redistribute the pieces in the wok. Then let it sit still again to brown and colour. Repeat this process once more. They will be cooked in about 4 minutes or so. Cut one of the pieces to see if it is cooked and then drain and keep warm on a plate. This fish is cooked perfectly. I might have drained off more fat or dried on kitchen towel – but as it will end up in a salad with an oil based dressing I have not worried. Stir-fying salmon as I shown here will keep the fish in neat pieces. The small fragments you can see are from a single piece that I broke to test for doneness. This warm salad starts life as a stir fry. Begin with the ginger, onion and chilli. Then add the salmon and stir to amalgamate the flavours. Set aside in a dish. Next briefly stir-fry the pepper, carrot and pak choi stalks put into a separate dish. 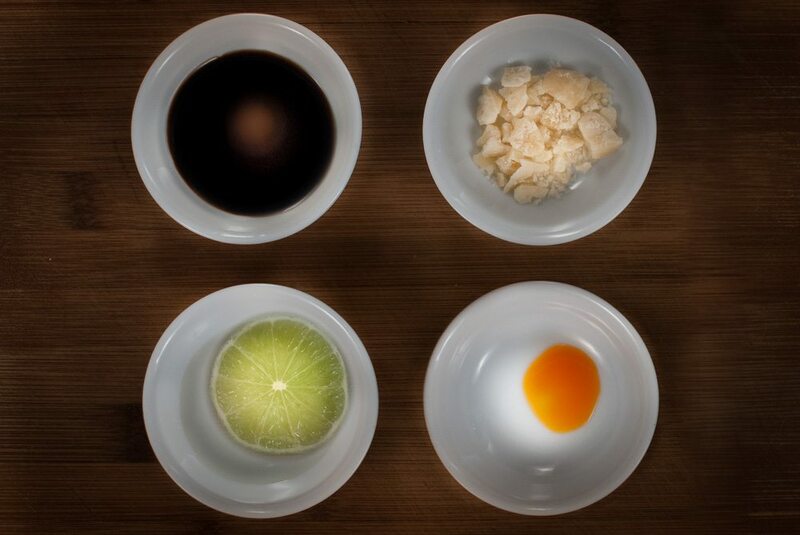 Mix the dressing ingredients to taste: from top left, nam plah, groundnut oil, soy, chilli oil, lime, palm sugar. The ingredients reflect the sweet, sour, salt, hot combinations that are so characteristic of Thai cooking. NB: the palm sugar will need to dissolve into the dressing – use a small blender or mix ahead of time to allow it to dissolve. Start with a proportion of 3 parts soy, to 3 parts oil, to one part nam plah, to 1 part sugar, to 2 – 3 parts lime – finish with a couple drops of chilli oil if you like. Finally, toss all the ingredients in a bowl with the dressing and serve. This method is a half-way house between stir-frying and deep-frying. The outcome makes perfect salmon nuggets for a fish taco. But the same nuggets could be served any number of ways and would be popular for young children. Fish tacos are a famous export from Baja California in Mexico. The fish can be battered and deep-fried or grilled. My way is a bit of a cheat and uses only flour and egg – it is very effective and tasty and less oily and fatty than batter. The coating does not have the crispy crunchiness of the deep-fried salmon below, but this is fine as there is plenty of texture and taste – enough to imagine you’re on a Baja beach enjoying Mexican fish and chips! The basic ingredients are corn or flour tortillas, cabbage for a citrus slaw, iceberg lettuce, tomatoes, avocado and creme fraiche, mayonnaise and lime for a lime mayo dressing. Chop and slice the salad ingredients. To make the citrus slaw marinade the cabbage with a good squeeze of lime juice, a large pinch of salt and a little sugar and leave for half an hour – or longer. The fish fillet does not need to be perfect. You can easily get four good sized tacos from this piece (about 170g). Cut the fish into random small bits – these shapes suit the nature of tacos. They also make attractive asymmetrical ‘nuggets’ for children. The beauty of this recipe is the simplicity of preparation. The only ingredients you need are flour and beaten egg. Dip first in the flour and then the egg. Keep the fish in a bowl until you are ready to fry. Fry the fish in batches in a very shallow pool of groundnut oil. Turn when browned and brown on the other side. Make a lime mayo dressing by mixing equal parts creme fraiche and mayonnaise and add lime to taste. Make the tacos by heating the flour or corn tortillas in a hot pan (without oil) for a minute on each side. Fill with salad, then fish and then mayo dressing. Chillies are optional. This time you can imagine you are on holiday in Britain eating scampi and chips! Here is the tableau of ingredients. I use panko breadcrumbs rather than a batter. It seems neater, and less fatty. Of course deep fried nuggets need something to dip into and tartar sauce is ideal. Finally, if you can go the extra distance, chips are the perfect accompaniment. Choose a piece of fish between 150g-200g for one person. The fish will go further when it is bread-crumbed (but then more of it is likely to be eaten!) It doesn’t need to be a perfect piece of fish as it will be cut-up and fried. Skin the fillet and cut into scampi-like shapes. Get four bowls ready with milk, flour, beaten egg, and breadcrumbs. Dip the fish into each bowl in the order listed (you will need larger bowls than those shown in the photo). Keep one hand for wet and one for dry, otherwise you will develop growing clumps of sticky crumbs on your fingertips. The bread-crumbed fish. These can be left quite happily in the fridge whilst getting on with the tartar sauce or chips. Heat a large deep pan with vegetable oil and heat up to 180C. Gently slide a few fish into the batter. Do this in batches. If too many are put in at once the temperature of the oil will drop, distorting cooking time and making the nuggets greasy. Dry the fish on kitchen towels and keep warm. Here are the ingredients for a tartar sauce. Chopped gherkins, capers, parsley. Creme fraiche, mayonnaise and lemon. When I mixed up the contents of these dishes I found I needed about the same again of mayo and creme fraiche. Some recipes call for shallots, but I find this can make the tartar sauce harsh and difficult to digest. Adding creme fraiche makes a lighter sauce. Serve the fish with chips and sauce. I’m reminded again about why it’s a good idea keeping leftovers. I fancied some soup and checked the fridge. 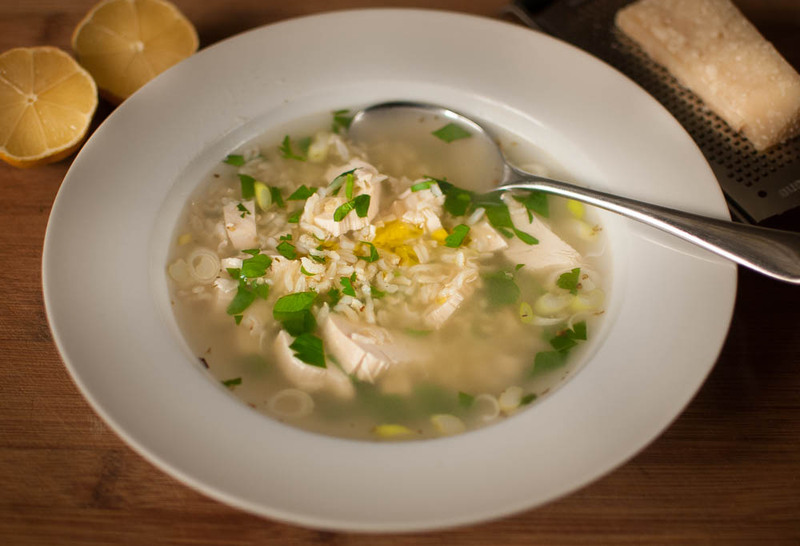 There was about half a breast of leftover chicken and rice – a no-brainer as far as soup goes… some chicken soup! I used chicken stock from a pot of concentrated powder (you can use a stock cube – but avoid those that are too salty or include MSG). I put 500ml hot water from the kettle in a pan, the chicken stock powder, the sliced chicken, a couple spoons of rice, a chopped spring onion, chopped parsley, dried oregano and ground pepper. I brought it to the boil and cooked for about 30 seconds. To finish I seasoned with a squeeze of lemon, some good olive oil and grated parmesan. All this took 5 minutes, and was enough for two. The final quality will depend on your stock, but either way it’s going to be way better than tinned soup.